Bold use of face brick colours contrast in a striking architectural design have resulted in an eye-catching school building servicing the Railton community in Swellendam, Western Cape. The R45-million project, which was completed in October this year, has provided school facilities for up to 1 120 primary school learners on the 31 575m2 site. Opting for environmentally-friendly materials, Miradi Architects selected the Corobrik face brick range, used for the construction of 90 percent of the building exterior. A number of “green” design aspects were incorporated including the sourcing of locally made bricks. Natural lighting was maximised through the use of shaded roof windows to eliminate the need for daytime artificial lighting and ceiling insulation will reduce loss of heat through the roof in winter helping ensure classrooms are warmer. Indigenous trees and shrubs were used for landscaping while a number of water-saving initiatives - including rainwater harvesting and stormwater collection - were incorporated to lower future costs. 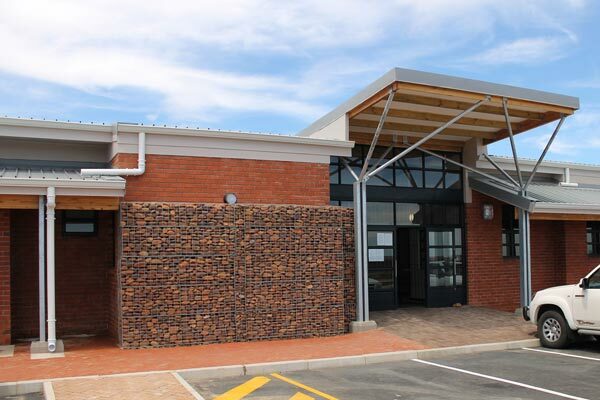 “The selection of Corobrik’s face bricks and pavers has not only had a visually appealing affect, but will ensure lifetime value for the school building with maintenance cost-saving from day one and comparatively low heating and cooling energy usage as well,” said Christie van Niekerk, Manager: Corobrik Western Cape. Thermal modelling studies by the University of Pretoria on day-time occupancy institutional buildings well show the superior thermal performance of double skin clay brick cavity walls and 220mm double brick ‘solid’ walls for providing longest periods of thermal comfort compared to insulated lightweight walling, this translating into some 48% lower energy usage than LSF specified SANS 517 in the Cape Town climatic zone. “Add this greater thermal comfort and energy saving of clay brick construction to the fire resistance attributes of clay brick and the sound insulation properties of brick that cocoons learners and educators in quiet teaching and learning environments, and clay brick wall construction presents as so superior, right and proper for school infrastructure”, said van Niekerk. Corobrik’s Sandstone Travertine and Tokai Red Travertine face bricks as well as Cape Stormberg pavers were used creatively to fashion a structure that is bold in design and colour yet blends into the surrounding area comfortably. Makombe said, for texture contrast, stones – which were picked on site by local, unskilled labourers – were used to construct gabion walls, helping to bring the “site” into the actual building. The school building includes a hall, 30 classrooms, administration, art, music, computer, care-taker and refuse rooms, a kitchen and sports field. 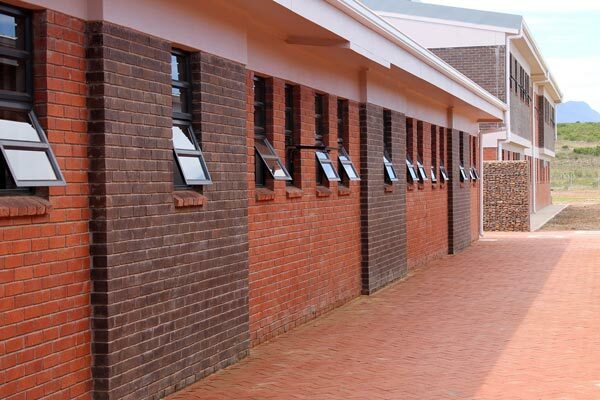 As the school is mainly on one level, Makombe said they decided to break up the “horizontal look” by creating vertical bands of recesses externally, using the Cape Stormberg pavers in a face brick application.